Running Staff selected under GDCE for the post of JEs: Admissibility of pay/stipend and other allowances such as ALKM/TA etc. Sub:- Admissibility of pay/stipend and other allowances such as ALKM/TA etc. to the Running Staff selected under GDCE for the post of JEs. Ref: Railway letter No. P(S) 353/lV/PGT Dn. Court Cases dated 29-08-2016 23-02-2017. Southern Railway had sought clarification whether running staff on selection to a non-running post under GDCE and who had opted for drawing of pay and allowances in accordance to paragraph 2(c)(i) of Board’s letter no. PC-IV/2006/Mics./5 dt. 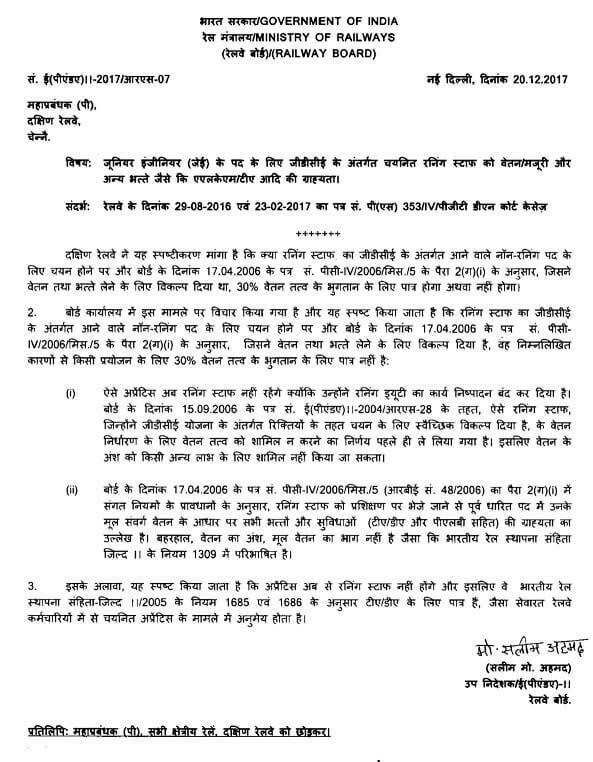 17.04.2006 would be eligible for payment of 30% pay element or not. (i) Such apprentices are no longer running staff as they discontinue performing running duties. A decision has already been taken vide Board's letter no. E(P&A)]l-2004/RS-28 dt. 15.09.2006 for not reckoning of pay element for pay fixation to the running staff who voluntarily opt for selection against the vacancies under the GDCE scheme. therefore the pay element cannot be considered for reckoning for any other benefit. (ii) Paragraph 2(c)(i) of Boards letter no. PC-lV/2006/Mics./5 dt. 17.04.2006 (RBE No. 48/2006) provides for admissibility of all the allowances and privileges (including TA/DA and PLB) on the basis of their substantive cadre pay of the post held before being sent on training as per the provisions of relevant rules. However, pay element is not a part of substantive pay as defined in Rule 1309 of the Indian Railway Establishment Code Volume II. 3. Further. it is clarified that the apprentices are no longer running staff and they will therefore be eligible for TA/DA as per Rule1685 & 1686 of IREC-Vol.II/2005 admissible as in the case of other apprentices selected from amongst serving Railway employees. Copy to : GM(P) all Indian zonal railways except SR.
Central Government Employee News and Tools: Running Staff selected under GDCE for the post of JEs: Admissibility of pay/stipend and other allowances such as ALKM/TA etc. it is clarified that the apprentices are no longer running staff and they will therefore be eligible for TA/DA as per Rule1685 & 1686 of IREC-Vol.II/2005 admissible as in the case of other apprentices selected from amongst serving Railway employees.